My husband makes the best chorizo and eggs. His trick is adding a little vinegar to the chorizo. It adds a nice zing to the eggs. I lightened his recipe using egg whites and serving it on a low point tortilla. You could also add minced onions and red peppers to the eggs if you wish, but I tried to stick to his original recipe. This is delicious served with hot sauce. Chorizo is a Spanish pork sausage seasoned with paprika, which gives it it’s distinct taste. If you can’t find chorizo, Portuguese Linguica sausage is similar in taste. A little goes a long way for flavor. In a small bowl combine egg whites, egg, salt and pepper and whisk well. In a medium saute pan, heat on medium heat. Add chorizo and cook about 1 minute on each side until slightly browned. Add vinegar and cook another minute to reduce. Add eggs to the pan and scramble until cooked, stirring often. Can this be freezed to prepare in advance? I found a vegetarian chorizo at the spanish market that is yummy! That should help with the fat and calorie count! I'm not sure, nut don't see why not! Any idea as to whether or not these would freeze well? It'd be so nice to grab one of these yummy little devils and heat it up on my way out the door! Kati- I think egg beaters is the same as egg whites. Hey Gina! I made this for breakfast today. Hubs loved it and so did I. This is definitely going in our rotation. Thanks for doing what you do! Any idea how many points one of these would be if I used Egg Beaters instead of egg whites? 🙂 Thanks!! I love burritos. So easy to make and there is so many different recipes. I usually mix all vegies and meat I have in my fridge. Thanks for sharing this recipe. I never tried it with eggs. @Jamie- Thanks for sharing! 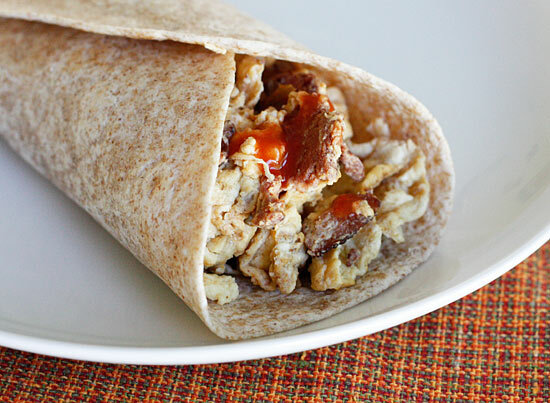 Wonderful idea making your own chorizo with turkey. I would use hot paprika in place of the red chile powder to really give it that authentic chorizo flavor! I'll be making this also, as my husband loves chorizo. We make our own turkey chorizo. He loves it more than me, cause its really spicy! Combine all ingredients well and refrigerate for 4 hours or overnight. 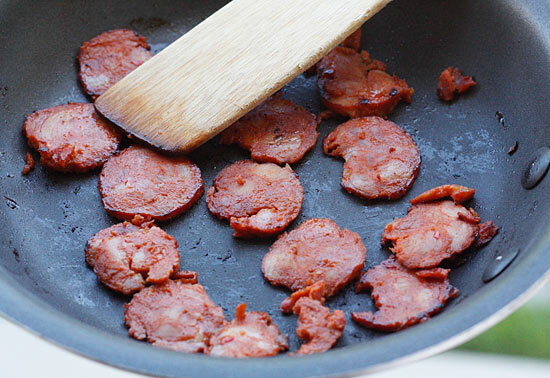 Cook the chorizo thoroughly in a nonstick sauté pan crumbling the meat as it cooks. Store remainder in refrigerator for 2 days or freeze. 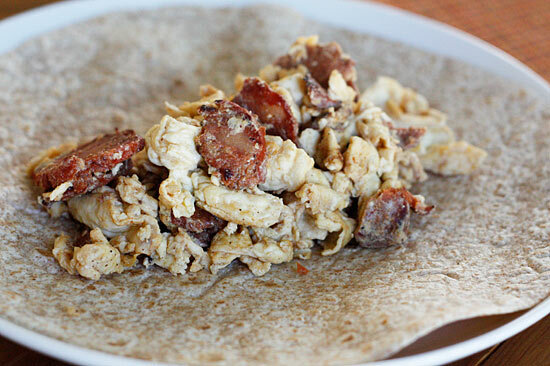 Turkey chorizo is great with egg dishes, on pizzas, and as a taco filling. Turkey chorizo, lucky you! The points would decrease tremendously! Soyrizo sounds interesting. Thanks for sharing! We can buy turkey chorizo in our area, which brings the fat content down, too. If I had some in the freezer I'd make this today– can't wait to try it–THANKS! Turkey chorizo?! Where do you live? I order my Portuguese Chorico from MA and live n MI. I’ll have to see if they make a turkey version. 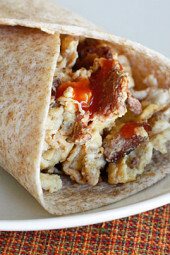 Love chorizo and love the idea of a breakfast burrito!! I do something similar, but use a Mexican style chorizo. The Mexican style is a uncured sausage. The real thing is in no way weight watchers friendly, but I've found versions using soy (http://www.elburrito.com/soyrizo.html) that are quite good. I love chorizo. I will be making this very soon.